Science Friday: Down with Ice Baths! Brr! So glad these aren't my legs. I hate ice baths. You come home from a hard workout, exhausted but glad to be done. But then it hits you, you're not done: the ice bath awaits. I bundle up and make a cup of steaming hot tea, but it doesn't help. Sitting among ice cubes is agony. An article in Running Times is one of many to question the ice bath recently. The theory behind ice baths is that the cold water forces blood out of your legs and back to your core, taking toxins and metabolic byproducts from your workout with it. 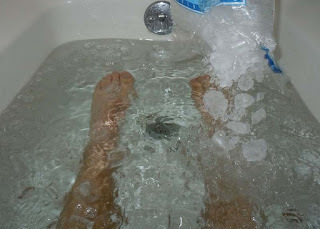 When you get out of the ice bath, the blood comes rushing back to your legs, bringing oxygen and nutrients. This should help you recover faster and reduce soreness in the following days. But research is showing that the inflammation and body's natural responses to hard exercise may actually be good for you. They help to build back the muscles stronger, which was the point of your hard workout in the first place. Sitting among the cubes may make you feel temporarily better, but not necessarily make you stronger. The Running Times article cites a study from 2005 looking at the difference between ice-bathed and un-bathed limbs. They had subjects either bike or use handgrips and afterwards submerged one limb in cold water (5 degrees Celsius = 41 Fahrenheit for the legs; 10 C = 50 F for the arms) and left the other limb at normal room temperature. One of the most surprisingly parts of this article was how the subjects reacted. In one study they had them submerge a leg for 20 minutes, take it out for 30 minutes, and then re-submerge it. The subjects called the first dip in close to freezing water as "close to comfortable" while the second was "moderately cold." I call ice baths many colorful words, but comfortable isn't one of them. (For most of the studies, subjects only did one ice bath.) They collected data three days before and three days after the exercise and ice bath. The Running Times article includes insight from big name coaches (Steve Magness, who just recently left his assistant position under Alberto Salazar, and Brad Hudson) and athletes (Ryan Hall and Hendrick Ramaala.) Magness says that the recent research has led the Oregon Project to stop using ice baths so frequently. (He notes that ice baths can still be helpful during an intense racing schedule, when it is more important to be ready for the next round then to make training improvements.) Ryan Hall, claiming ice baths are "not a fun part of the job," has also stopped using them. The article does note that Molly Huddle still uses them and says she feels better afterwards, acknowledging that it doesn't matter if it's just a psychological effect. Using my WWKD theory (Kara used to work with Magness), this means I'm free to skip the ice baths! 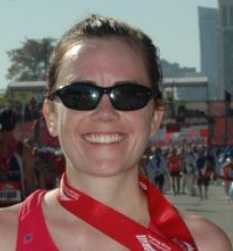 Congrats on the new PR in 5K! Keep at it!